Not all chocolate is made alike: Enjoy this nutrient boost anytime of the year. You don’t have to get sugar loaded chocolate to enjoy this treat, which is packed with antioxidants, and good fats. 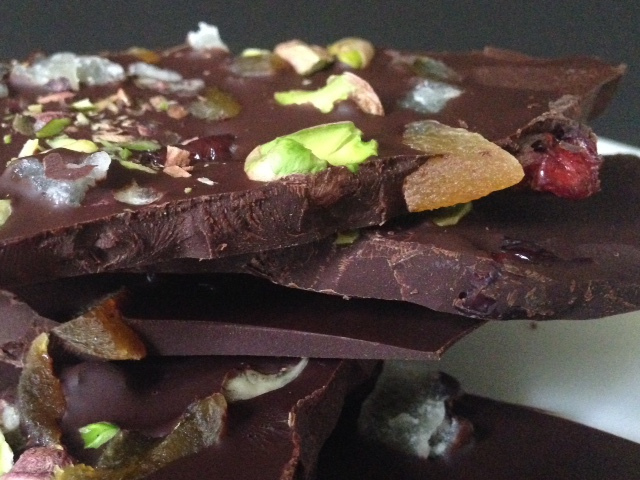 The following, is a recipe for chocolate bark using dark chocolate, dried cherries, pistachios, dried organic pineapple and apricots. Most chocolate we eat is milk chocolate and semi sweet chocolate. Here is a quick lesson in chocolate. The higher the percentage of cocoa mass, (>60%) the healthier the chocolate. We are talking 72%-85% cocoa having more nutritional bang. Lot less sugar is added and more nutrients like flavanoids are available to you. Milk cancels out antioxidants, so milk chocolate or hot chocolate with milk will not have any nutritional effect. Fat? We have 0 cholesterol in chocolate and yes, stearic acid is a saturated fat but has no effect on raising cholesterol. Health benefits? Lowering of blood pressure, and preventing artery plaque buildup are a few of them. 1 ounce of 72% chocolate has around 170 kcals and 5-6 grams of sugar. I discovered Green & Black’s chocolate to be creamy rich with a hint of sweetness. Great for making bark with dried fruit added to the mix. 1/4 cup dried cherries, apricots and pineapple or any combination of dried fruit. Chop up the chocolate and place the pieces into a stainless steel or other heat resisitant bowl. Prepare a cookie sheet with parchment paper covering the entire surface. Heat up to simmer 3/4 cup of water in a shallow pan, and place the bowl of chocolate over the water and melt until smooth. Remove from the heat. Pour the chocolate onto the parchment paper to cover approximately a 10 inch by 6 inch rectangle. Sprinkle the fruits and nuts of any combination over the chocolate and keep in the refrigerator to cool for 1-2 hours. Remove from the refrigerator and peel away the paper and break into small pieces.